Any body is using Photon plus. How the speed is? So that I have to decide about whether I have to go for BSNL or TATA. Can anybody know the procedure to get BSNL broadband in bangalore? According to Customer Service Airtel is Good in bangalore. Goto your area exchange and tell them you need BB connection, if you already have a landline connection then directly apply for BB connection else apply for the landline first, later after you get the line then apply for BB. Time to get the landline connection depends on the area you are in. may take from 2 days till 15 days. Just confirm in exchange. Once you get landline then apply for BB, charges will be 250 Install, and 1 month plan charge as deposit ex:if you take 750UL plan they will take 750rs deposit. BB will get activated in around 7 days. I Was using Airtel BB. It was good and Customer Service also. But now I am moving to some new place. They said that they don't have any available port there. so I am looking for some new SP. Photon Plus is wireless by TATA. I know only that. I need to know about the performance.. I have bought my photon plus in Patna in end July (my Tata Indicom Account No is 975359862) and the decision was purely based on the extensive advertisement of this product at that time all over India backed up by Tata name. Right from the day one my experience with Photon plus has been pathetic. Getting the service started was the first challenge. It started with Tata indicom office people losing my form . So i/o of taking 2 working days for getting the connection started it took more than 5 days to get the connection working. Before deciding the usage plan, I did explain to them the purpose of my going for High Speed device, which was Audio/Video chat through Skype for 30-45 minutes every day, abt 30 minutes of net phoning per day , and at-least 8-10 hrs of e-mail connection per day. Based on my requirement, they advised me to go for Rs 750/- per month plan. I never got the speed more than 1/20th of what was promised to me. I could never do video /audio calls through skype , nor could I do any net phoning. The voice qlty in both the cases were never clear when ever I dared to waste my time with the system. The worst experience came with the billing system. The first bill (by post)came for abt Rs 500.00 in end Aug,. after I left for Thailand, my country of residence, on 17th Aug. The bill was paid in Sept. 1st week. I got an e-mail to pay Rs. 1580.00 after I came back from Thailand on 9th Sept.. My staff paid Rs. 1600.00 on 17th Aug. Even after payment, I kept on receiving SMSs and e-mails for paying amount some times 2000, sometimes 1500, etc,. The amt. used to be higher some times and some times lower. I don't what billing system do they use. I got a bill by post again on 25th Sept. to pay Rs. 850.00 for which the last date was 26th Sept. Since Puja vacations came in between, I sent my staff on 3rd Oct. to pay the bills. In Tata Indicom office he was told that no amount is due against my name and they did not accept my payment. I kept on receiving SMSs and e-mails for paying amounts ranging from Rs. 3,000-5,500 on regular basis. I had the visit of a rep. from Tata Indicom for corporate mobile connections in the 1st week of Oct.. Upon listening my problem, he advised me to change to Rs. 1,100 plan, which I did immediately by giving him a request letter. In the week that followed,I had the visit of another senior executive from Tata office alongwith that rep. for the same corporate mobile phone. He suggested me to send him an e-mail explaining my problems in detail. Two reminders have gone , but there is no reply from that gentleman. In between, they disconnected my line on 12th Oct. afternoon. Before I left for Thailand again on 14th Oct. , I had requested many times to send my a/c statement in detail, which has been received now after I left Patna. There is an e-mail today also to pay Rs. 3,552.00, while the bill received by post has due amount as Rs. 5,000+. I do not have any faith in the photon plus people and the system both. In my opinion, they should be charged with selling a product through a false and a misleading ad. Secondly, there should be a full enquiry on their billing systems and on their so called customer care deptt. for harassing the customers by sending wrong SMSs, e-mails, and by making tel. calls. Any body can help me recover my Rs. 3,500.00 for the devise from Tatas, I would be grateful. unless you are on the move constantly, it's not advisable to take photon plus. i have been using it for the past three months and i can tell you the speed is quirky at best. the plan i have is Rs. 1655 monthly unlimited download with speed upto 3.1 mbps, but i hardly get anywhere near that. i guess speed is dependent on things such as number of users on at a time etc, but due to it's portability i can't really have any complaints. if you are using your net for downloading torrents etc, it's better to go for BSNL or airtel since the speed will be more reliable. I have Relaince Netconnect+ and some my colleagues Tata Photon+. When coming to connectivity, both give good speeds in Tier 1 cities but revert to CDMA 1x (144 kbps) when outside these cities. Both do not give anything like 3.1 mbps as advertised - it is more like 2 mbps and that too in the off peak times. During peak hours the speeds are more like .5 to 1.9 mbps. 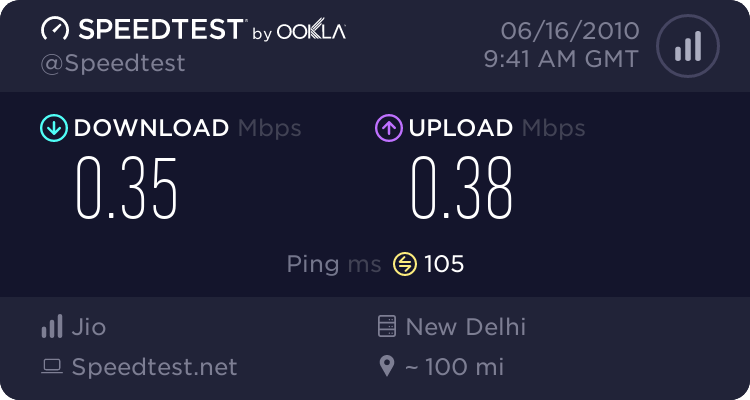 And I have seen Netconnect+ revert to 1x (from Hybrid) many time in Pune during peak hours. Right now, these are more like 350 kbps. I am photon+ customer in West Bengal and I would say that I am somewhat satisfied with the service and the net speed. I use the service in a remote town in West Bengal called Murarai, which is some 255 km from calcutta. Also, it will never give you the speed advertised, and that too in a wireless connection. 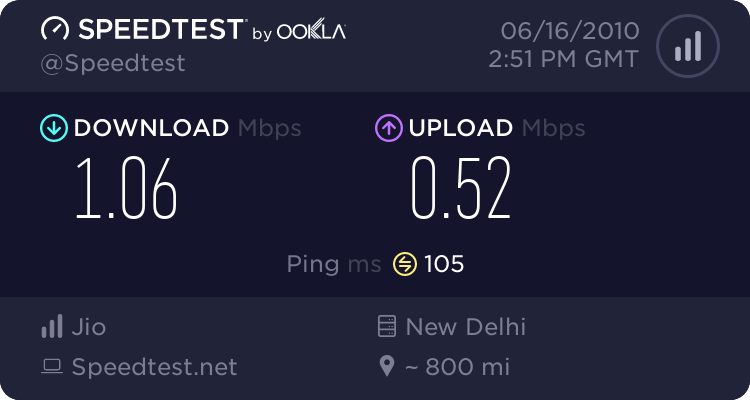 I sometimes check my speed with Bandwidth Place and it shows my download speed at about 135 to 150 kbps and the UL speed at about 44 to 50 KBPS. This is not a mean feat in a district place, which has no Tire I cities nearby. I've recently bought Tata Photon. I'm highly disappointed with the service. They have junks in their customer care who even cut the call, if pressed for resolution or escalation. I've never seen such a behavior with any of the service provider. I've submitted the verification form twice. But it was mishandled by Tata Photon and they've disconnected my connection despite promising to activate it within a day. I've made more than 20 calls and emails. Every time I got a different response from the customer care. The issue was dragged for a month despite SLA breach and several request for 48 hours extension. Finally, they've stopped responding to my emails. Overall it was a worst experience. Please.. Please .. Please do not buy a tata Photon even if some one offers it free. I'm saying this despite being a tata employee. It doesn't fit to be in a Tata group. I can share the conversation I've had with helpdesk. It was a painful experience. Photon whiz and photon plus confusion.